This is my photographic record of four flow events in Creswick Creek on Thursday 12/8/2010, Saturday 4/9/2010, Thursday 13 and Friday 14/1/2011, and the night flood over Friday 4 and Saturday 5/2/2011. I also seek to examine the current situation, how it has evolved, identify obstructions to the “clear flow for water” through the township, and what “something needs to be done” might be, and if indeed the engineers got it right. Creswick is located on high country in mid-western Victoria, 15km north of Ballarat, 37.42S 143.89E, elevation 424m. The mean annual rainfall is 750.6mm, for Jan 42.6mm. Mean monthly rainfall from Dec to Mar is under 50mm. Creswick Creek rises in the hills to the south-east near the township of Dean, and flows generally north-west via Cosgrave Reservoir and St Georges Lake. St Georges Lake is a dam about 2km above the town. It has two spillways, a low or minor one at the north end and a major or high overflow at the south end. These two channels join a short distance below the dam to form Creswick Creek. Only a few hundred metres below St George Lake Slaty Creek joins Creswick Creek from the south, restricted by the Melbourne Rd bridge, at Northcott Park. From this point the creek line originally meandered considerably on the fairly wide and flat floodplain below Northcott Park. As a result of historic gold mining activities it is now highly aligned and has no meanders at all. This broad floodplain ends at Water St where the creek enters the central township. Below the Water St bridge it had its line relocated to the east to allow development of blocks on that side of Albert St, straightened in channel with stone walls in 1862, and confined on the lower Albert St side with a small levee bank. Above Water St there is a wide floodplain, but below there the available channel is highly confined to about a quarter of the width above, and at about the same gradient or fall. Any constriction means that the water must accelerate in equal proportion, and if the gradient is insufficient water will accumulate and flood. It is this section, between Water St and Castlemaine Rd bridges, where the worst flooding (inundation with flow) is occuring, while severe static inundation is also occuring around Cushing Av on the west side of Albert St. The basic reason is that these are close to, or actually on, the historic creek line. The creek passes under the Castlemaine Rd bridge, turns left past North Pde which has suffered serious and early flooding, and under the Clunes Rd bridge. Again, below that the creek has been converted from broad meanders into a wide straight channel past Calembeen Park, and on into the wide flat section, under the high level railway bridge above the Davies St floodway. Overall the creek has already been highly modified from original, fully aligned, and significantly displaced from its original line through the town. The most serious flooding is occuring where the creek has been moved east from its historic line between Water St and Calembeen Park. By accident or design the creek has already had a severe application of the traditional standard flood mitigation treatment - alignment, yet it is still flooding. When LaTrobe University was built the creek above was straight-drained through the middle and the campus initially suffered severe floodings. The Ecological Reserve was established and the meandering creekline above the campus restored with three level wetlands, and the flooding stopped. 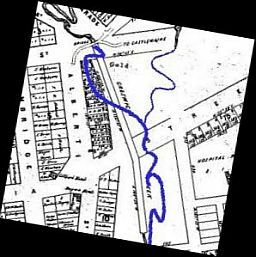 There was a major flood in 1860 when mining dams upstream were washed out, and this may have prompted the realignment behind Albert St two years later. In 1933 another dam breach from heavy rain caused lower Albert St to flood. The only known clearing of the section between Water St and Castlemaine Rd was carried out in 1967-8. Like much of Australia the area received below-average rainfall for a number of years before 2010. St Georges Lake was one of the least effected bodies of water in Victoria, but had still dropped to about two metres below the spillway by 2010. Creswick Creek was normally quite dry and any flows that did occur were minimal and short-lived, and came from Slaty Creek and any direct runoff, not St Georges Lake. Actually this event wasn't a flood but more a freshet where the creek only exceeded its banks in a few places and no serious flooding occured, however this is useful as a baseline event for what followed. The level at St Georges Lake minor spill was at the top of the trashrack, perhaps 600mm. The level at the major spill was just brimming, perhaps 10-20mm over the lip. There was only about 50mm on the path with a very light flow and it was easy and safe to walk across the major spillway at the picnic ground. The estimated flow was of the order of 5 cubic metres per second. Following persistant very heavy rain there was major flooding of properties in Albert St, Cushing Av, Cambridge St, and North Pd, causing very considerable personal and commercial losses. This time, with the lake already full, it was a different story. Now there was around a quarter of a metre over the big spill lip and flowing strongly. The level was half way up the BBQ's and there are unconfirmed reports of it level with the top of the BBQ's at one point. The estimated flow was of the order of 30 cubic metres per second. This flow expanded into the floodplain from Northcott Park to Hammon Oval and Water St bridge. The amount of gravel deposited on Northcott Park is evidence that the flow slows considerably at this point as the bulk of the flow spreads out over the floodplain, and only a small proportion in the actual wooded creek line. At the Water St bridge choke the flow was re-concentrated and accelerated, backing up along the alignment behind the Albert St properties, flooding them, then diverting via Pearman St and the Bowls club, proceeded down and across Albert St, and back to the creek via Cushing Av and surrounds. Bureau of Meteorology rainfall maps show that on the 13th January the Creswick area received between 25 and 50mm (1 to 2 inches) of rain. This is a typical rainfall for all of January in a single day. This pushed the creek to maximum flow capacity of around 30cu.m/s but only caused some minor flooding. Over the next 24 hours however another 50 to 100mm (2 to 4 inches) fell in the catchment. In less than 48 hours Creswick received rainfall equal to the typical three summer months from Dec to Feb.
A number of people estimated that the amount of water was greater than the 4/9/2010 event, that the flow was swifter, but also that the level at the Albert St bus shelter and Bowls club was lower. These apparently contradictory observations could be explained by the creekline being cleared by the previous flood and now able to carry a larger proportion of the flow. The photo gallery leaves no doubt about the respective sizes of the three events. It must be said that the flow of water during this event was truly extraordinary, and historic flood levels were being equalled or broken across the State, not least along the Loddon River system of which Creswick Creek is a headwater. The estimated flow was of the order of 102 cubic metres per second. On the input side we have around 100 cubic metres per second from St Georges Lake and Slaty Creek combined. During the 14/1/11 event the level on Hammon Park went over the surrounding fence posts and flowed around the bridge across Water St and down Moore St, so this bridge was slightly over-capacity. It also suffered some erosion of its abutments (which is consistant with its design capacity being exceeded). What is horribly obvious is that the Castlemaine Rd bridge has around half the Water St bridge flow area, 34 against 69 sq.m, so in theory the water velocity must double to clear the flow. Again this requires fall to drive it and again the water must back up until there is sufficient head or fall to drive it to the required velocity, and doubling to six metres per second, more than 20kph, is a very big ask indeed. So again the flow backed up until it was high enough to flow over Castlemaine Rd. The same dynamic is also happening at the Clunes Rd bridge just down stream. The finger points directly to the Castlemaine Rd bridge, and the need to at least double, and better triple, its available flow cross section and that of the Clunes Rd bridge. The event of 12/8/10 at 5 cu.m/sec didn't exceed the overall flow capacity. On 13/1/11 a flow of between 10 and 20 cu.m/sec was still within the channel, however the Castlemaine Rd bridge was already close to capacity, and North Pde and Cushing Ave/Cambridge St had already flooded. The event on 4/9/10 at around 30 cu.m/sec caused flooding in large part because the Castlemaine Rd bridge was obstructed by debris, but even when that was removed the bridge was still near or over capacity. The event on 14/1/11 at a flow at 102 cu.m/sec was literally one for the record books. It has been called a “one in 200 year event” which is misleading because rare events can occur in clusters. Floods are rare events, but when there is a widespread cause such as a La Nina event it is quite possible to suffer a number of such rare events in a short time frame, as has just been illustrated across eastern Australia. Friction due to vegetation in the channel between Water St and Castlemaine Rd is significant, but only a minor part of the whole picture, (see More Numbers) and removing it will only make flooding in the lower Moore St and North Pde areas worse. o The construction of a hydrological model of the creekline from Northcott Park to the Davies St/Ring Rd floodway as a matter of urgency. o From these events it appears that the creekline below Water St is capable of carrying more than 30 cu.m/s within the existing channel, and that the flushing of debris by the earlier event didn't make a lot of difference to this capacity. Some clearing of the channel along Moore St is certainly required but treatment of the bridges is even more urgent. 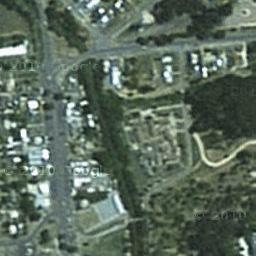 o That the Castlemaine Rd and Clunes Rd bridges be replaced with low level floodways or clearspans. o That a major pipe capable of carrying the flood flow be established from the “sludge channel” above Victoria st to the west lake at Calembeen Park. “Creswick Creek”, J.F.S., Creswick District News, Oct 2010. These volume estimates are based on an estimate of the width and depth at a known point, and an estimate of the water velocity. While the widths and depths have been post-checked at St Georges Lake high spillway, Water St bridge, and Castlemaine Rd bridge, the velocity is still an estimate subject to significant error. Albert St shopkeeper and flood victim - personal communication. Helen, Web Words, The Courier p 14, 17/1/11, Ballarat.